Do you believe in ghosts and spirits? Josiah Wilbarger certainly did! Why wouldn’t he, when a spirit saved his life? On a hot August day in 1833, Texas settler Josiah Wilbarger and four other men were scouting territory near present-day Austin when they spotted a lone Comanche and gave chase. The brave escaped the party, and Wilbarger and the others turned back toward neighbor Rueben Hornsby’s cabin six miles away. At mid day, they decided to stop for lunch beside a small stream and give their horses a rest. Wilbarger, Tom Christian and a Mr. Strother unsaddled and hobbled their horses. Haynie and Standifer, wary of the Indian they had seen, decided to leave their mounts saddled and tied them loosely to a nearby tree. The men started a fire to cook beef, and passed around cold corn pone. They were relaxed by the water when war whoops and rifle fire accompanied by flying arrows shattered their peace. The five men jumped behind trees and began firing, but the spindly scrub oaks offered little protection. Haynie and Standifer ran to their saddled horses. Wilbarger called out to them and they turned to see Wilbarger with arrows in both legs. He took a shot to the back of the neck which exited through the front of his throat, spurting blood, as Comanches surrounded him. Certain their friend was beyond help, Haynie and Standifer rode hard for Hornsby’s cabin. At Hornsby’s, they sent a rider on to Wilbarger’s home some miles away to relay the sad news to Josiah Wilbarger’s wife, Margaret, and to rouse other neighbors. By the time men arrived from the surrounding area, it was too dark to retrieve the remains for burial. As everyone slept that night, Sarah Horsby suddenly awakened from a dream that left her trembling. She woke her husband and told him of the vision of Josiah Wilbarger, naked and leaning against a tree. Her dream convinced her he was alive and waiting to be rescued. Reuben scolded his wife for waking him because he and the others had to rise early the next morning. He reminded her Comanches never left their victims alive, cutting throats to be certain they were dead. Sarah was unconvinced but went back to sleep. Within a short time, the dream returned exactly as before. She awakened her husband and the other men. As she served them breakfast, she told them the dream was an omen and that they would find Josiah exactly as she had envisioned. She told the men to wrap Josiah in a sheet and bring him back for her to tend his wounds. The men scoffed at her vision. Reuben knew his wife was not given to irrational thinking, so he was less skeptical than the men with whom he rode. The mother of ten, Sarah had survived the rigors of frontier life and had more than her share of experiences with Comanches. When the men arrived at the site, they immediately found the bodies of Christian and Strother. They buried the two while looking for Wilbarger. As they were about to give up their search for him, a rider spied what looked like an Indian leaning against a tree, naked, and covered with red war paint. The rider called to the others then raised his rifle to shoot. The naked man stumbled toward them and said, "Don’t shoot. It’s Wilbarger." Though scalped, wounded in several places, and near death, Wilbarger was just as Sarah Hornsby said he would be. The rescuers gently wrapped him in the sheet Sarah had provided. Reuben held Josiah as they rode slowly back to the Hornsby cabin. Confident he would be found alive, Sarah waited with hot water, bear’s oil, and poultices ready. She nursed him for several days until he was able to be transported home on a makeshift sled. Wilbrager described his ordeal. The bullet that passed through his neck temporarily paralyzed him, and he couldn’t resist the Comanches who attacked him. Not only did his injury convince the Indians there was no need to slit his throat, it also prevented him from feeling pain. 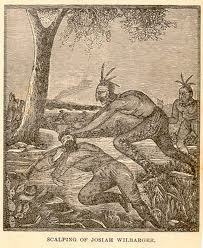 However, he was alert as the Indians roughly stripped him and scalped him. He reported that it sounded like distant claps of thunder as they jerked the scalp from his head. He fell unconscious until late afternoon. When he awakened, the paralysis had left his body and he experienced terrible pain. He crawled the few feet to the creek and remained in the cold water until he was numb. Before he fell into what was probably a comatose state, he crawled out to a sunny spot. When he awoke, he became aware of swarming blowflies feasting on his exposed wound. In hastily stripping him, the Comanche left him with one sock. He shooed the flies away and covered his head with the sock. He tried to move toward Hornsby’s, but managed only about six hundred yards. Believing his death was inevitable, he leaned against a tree and hoped for rescue. A vision of his sister, Margaret Collins, who lived in Missouri, appeared to him. She spoke softly, "You’re too weak to go on, brother dear. You lie here and rest and help will come to you before another day is over." She turned and headed toward Hornsby’s cabin. When Sarah described the woman in her vision, Wilbarger told her that was his sister. Weeks later, Wilbarger received a letter from Missouri. His sister Margaret had died the day before the Comanche attack. He firmly believed he saw his sister’s spirit that night, and that she not only gave him courage to hold on, but also alerted others through Sarah Hornsby’s dreams. People who knew both Josiah Wilbarger and Sarah Hornsby attested to their honesty and mental soundness, and believed their stories. made caps for him that he wore constantly. After coming to Texas when it was a part of Mexico, the Wilbargers and Hornsbys joined Stephen F. Austin's 300 as Texas pioneers. Wilbarger eventually operated a cotton gin near Bastrop. One day while walking through the building, he hit his head on a low ceiling beam. For most people, the event would have merely raised a bump. For Wilbarger, with no hair or scalp to pad the skull, the injury was fatal. He died on April 11, 1844. A monument at Fifty-first and Berkman Streets in Austin marks the estimated site of the scalping. Josiah Wilbarger and his wife have been reinterred in the state cemetery in Austin. Sarah and Reuben Hornsby are buried in the Hornsby Cemetery at Hornsby Bend near Austin. (Baseball Hall of Famer Rogers Hornsby is a descendent of this pioneer family and is also buried in this cemetery.) Margaret Wilbarger Clifton, the spirit who saved her brother, is buried in Florissant, Missouri. Now do you believe in ghosts? Thanks to FROM ANGELS TO HELLCATS: LEGENDARY TEXAS WOMEN, by Don Blevins. Thanks also to other sources including THE HANDBOOK OF TEXAS ONLINE and Wikipedia. Oohh, that's a great story. It gave me chills. Thanks for sharing. Thanks for stopping by, Jennifer. I also believe in ghosts. What an incredible chain of events! The human spirit knows no bounds, but also, it's amazing what the human body can endure. Fascinating! Definitely believe in ghosts! What a fantstic story! It kept me glued to the page to the end. Caroline, I have a vague recollection of this, so I'm very happy to read the entire account.I cannot imagine what so many of our citizens went through to settle Texas in the face of the Comanche. You know I admire the Comanche to some extent. They had their reasons and ways, just as all other human beings do. I'm not a pure believe in ghosts or visions, but I don't discount them either. Haven't we all had "feelings" something would happen, and perhaps it did? Thanks for this wonderful tale--I truly enjoyed it. Wonderful story. And utterly fascinating. Fascinating story. Sure, I believe in ghosts, or spirits, whichever you wish to call them. My mother, grandmother, uncle, and an aunt "visited" me in the hospital in 2005. They didn't say anything, but stood at the end of the bed in ICU and smiled at me. They are all on "the other side of eternity." That happened during the time I was unconscious for 10 days. Wow Caroline, what an incredible story, it gave me goosebumps. What an interesting accounting and what an interesting person to have survived an ordeal like that. History is so interesting and people just couldn't make up stories like that. What a great post.Those pioneers were tough people. Can you imagine the whining people of today enduring what they did. They would probably be suing the state for not protecting them! Sounds like there were some psychic phenomena going on. Great story! 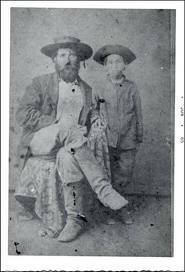 May I ask about your source for the photo of Wilbarger and his son? It's been so long now that I'm not sure where the photo is from. If you Google Josiah Willbarger, you will see the photo I used in Google commons. When I looked to identify the precise source, my article was listed. Sorry I can be more specific. HEADING WEST - LOAD THE WAGONS!